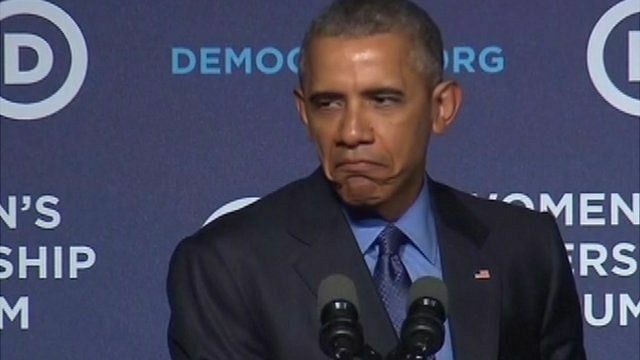 Obama mocks 'Grumpy Cat' Republicans Jump to media player US President Barack Obama hits out at his Republican rivals, accusing them of being "so down on America" and always suggesting that "everything is terrible". Obama makes off-script joke Jump to media player President Obama jokes during his State of the Union address that he has no more campaigns to run because "I won both of 'em"
Obama jokes at annual dinner Jump to media player President Obama has been poking fun at himself and his political friends and enemies at the annual White House Correspondents' Dinner. Obama smells smoke at Science Fair Jump to media player The smell of something burning at the White House Science Fair gave President Barack Obama the chance to joke with students about the War of 1812. US President Barack Obama has hit out at his Republican rivals, accusing them of being "so down on America" and always suggesting that "everything is terrible". "They are gloomy. They are like Grumpy Cat," the president added, referencing the feline internet sensation, as he addressed the Democratic national committee's women's leadership forum.